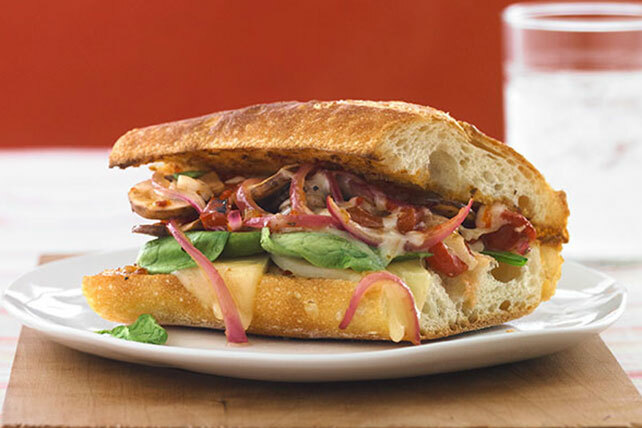 Give your grilled cheese some veggie flavor with a Grilled Cheese and Vegetable Baguette. Mushrooms, roasted red peppers and fresh spinach make all the difference in this Grilled Cheese and Vegetable Baguette. Toss onions with 1/4 cup dressing in medium microwaveable bowl; cover with waxed paper. Microwave on HIGH 1-1/2 min. or until onions are crisp-tender. Add mushrooms, peppers and mozzarella; mix lightly. Brush remaining dressing evenly onto cut sides of baguette; cover bottom half with provolone, spinach and onion mixture. Broil both halves, 6 inches from heat, 3 min. or until cheese is melted. Cover bottom half of baguette with top of baguette. Cut into pieces to serve. Substitute arugula for the spinach. Serve with a fresh fruit salad to round out the meal!